The Earth is an electrified body, moving in a plasma. We who stand on its surface are seldom aware of its electrical properties. That's because we live in balance with the Earth's electric field. Similarly, a bird on an electric wire has no idea that high-energy currents of electricity are flowing beneath her feet. But she might notice the hums and crackles that are side effects of that current. Like the high-tension wire, our Earth produces hums and crackles as it responds to surges of power in the electric currents of space. 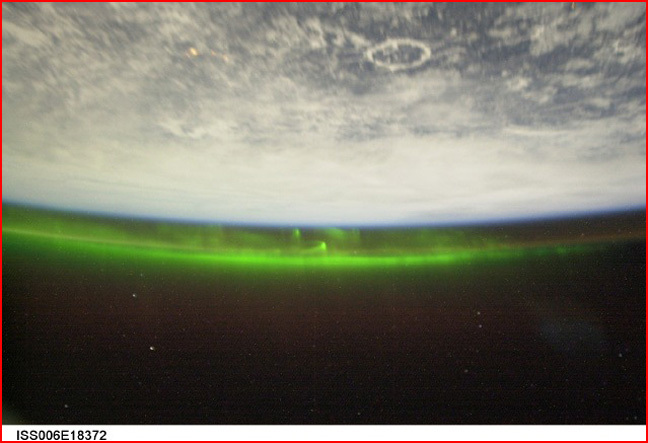 Perhaps the most obvious sparks are the auroras, as seen in the above picture taken from the International Space Station in April 2003. The complex patterns of electric currents and magnetic fields surrounding the Earth are how the Earth's electric charge adjusts to the Sun's electric field. These electrical phenomena were a complete surprise, discovered by satellites launched by astronomers who expected to find the Earth isolated from the rest of the universe by featureless vacuum. Instead, they found the near-Earth environs alive with energetic activity. Other electrical sparks that the Earth produces go unnoticed because we have lived with them so long that we think we know what causes them. Many meteorological phenomena are electrically driven. We've always thought of lightning as electrical, and now we're beginning to realize that we can think of tornadoes and hurricanes as electrical phenomena, too. But less spectacular weather conditions like dust devils and waterspouts are also electrically driven, as are larger weather patterns, the jet streams and El Niño. Earthquakes can be induced by pumping electricity into the Earth, and natural quakes are often accompanied by or preceded by electrical glows called earthquake lights and radio frequency static. Volcanoes are often accompanied by copious amounts of lightning. No one died from the lava flows or cinder bombs during the decade- long eruptions of Paricutin in Mexico, but three people were killed by its lightning. All of the Earth sciences could profit from asking the question: How do the discoveries of Earth's unexpected electrical environment affect our discipline? How many concepts have been overlooked because until a few decades ago no one suspected that Earth is an electrified body moving through a plasma?